‘Auntie Boss’ actress Nyce Wanjeri is indebted to Kenyans for coming through in massive numbers to vote for her as the 2018 AMVCA Best Actress in a Comedy(Movie/Series). The 6th edition of the Africa Magic Viewers’ Choice Awards went down at the Eko Hotel and Suites in Lagos, Nigeria, on Saturday, with Nyce one of several Kenyans to make the country proud. 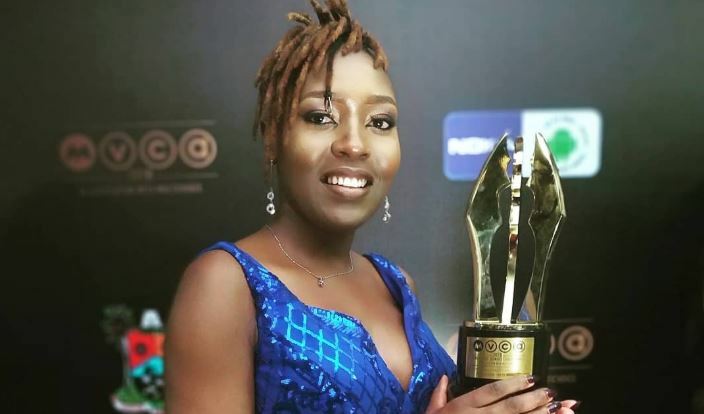 Ms Wanjeri beat big names in Nollywood including Rita Dominic and Adesua Etomi, and she was beyond humbled as she took to social media to pen a heartfelt message about the big win. 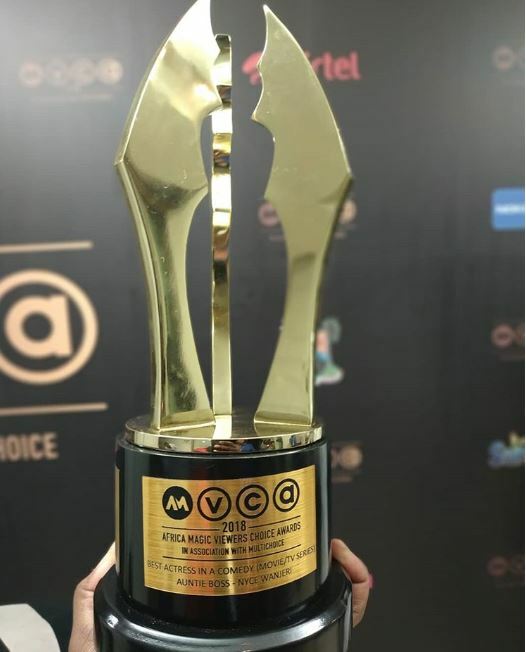 “This is one of the best times in my life, from an unknown village girl, to a Kenyan household name, and now an AMVCA 2018 award winner, recognized in Africa! I have the trophy at home to prove it but I still can’t believe it! God indeed is a master of Impossibilities! I was nominated in a category alongside industry greats. Who am in that list of greatness but a humble girl still finding her roots in a young Kenyan acting industry? But you know what, I took it to the Lord in prayer. On my knees is where the battle was won. Mine was one of the few categories where public voting determined the winner, sema wakenya kukuja 10 million strong, kuumira kuumira! I felt the love and continue to feel it! This time, Your Votes Counted and they Counted massively, that is an actual report I received from a panelist after the win. Kenyans Voted! So to all my fans, God bless you greatly! I love you all so much, I am really indebted to you! Truth is, my talent could only take me so far without the opportunity offered to me by Mwangi Lucy and Eve D’souza. ‘Auntieboss’ has been life changing and I will always love and respect where I came from, thank you moonbeamkenya family! A huge thanks also to my support system, my hubby Tito and my daughter. Tasha, you prayed and asked God to give it to mommy and nobody else, see God, He answered your prayers! I can’t forget my manager Daddie Marto for taking a chance on me, the work we did was all worth it! Mum I know you are watching this, she won mum and she went to Nigeria, cheeeeeei!! Long post alert! First of all, #GodNiMsoo! This is one of the best times in my life, from an unknown village girl, to a Kenyan household name, and now an #AMVCA2018 award winner, recognized in Africa! I have the trophy at home to prove it but I still can’t believe it! God indeed is a master of Impossibilities! I was nominated in a category alongside industry greats like @adesuaetomi @bimboademoye @dakoreea @queennwokoye and the one and only @ritadominic. Who am in that list of greatness but a humble girl still finding her roots in a young Kenyan acting industry? But you know what, I took it to the Lord in prayer. On my knees is where the battle was won. Mine was one of the few categories where public voting determined the winner, sema wakenya kukuja 10 million strong, kuumira kuumira! I felt the love and continue to feel it! This time, Your Votes Counted and they Counted massively, that is an actual report I received from a panelist after the win. Kenyans Voted! So to all my fans, God bless you greatly! I love you all so much, I am really indebted to you! Truth is, my talent could only take me so far without the opportunity offered to me by @mwangilucy and @evedsouza. @auntieboss_ke has been life changing and I will always love and respect where I came from, thank you @moonbeamkenya family! A huge thanks also to my support system, my hubby @titokenyamsanii and my daughter. Tasha, you prayed and asked God to give it to mommy and nobody else, see God, He answered your prayers! I can’t forget my manager @daddiemarto for taking a chance on me, the work we did was all worth it! Mum I know you are watching this, she won mum and she went to Nigeria, cheeeeeei!! To @multichoice_africa @ntvkenya @maishamagiceast thank you, thank you, thank you so much. Kenya we did it!! #OneJerry #ShiruWarugongo God Bless You all! !